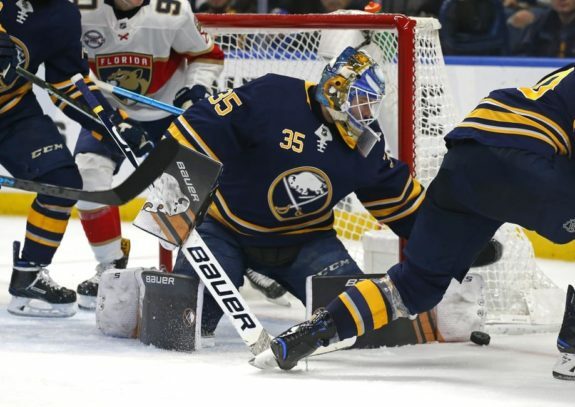 BUFFALO, N.Y. — Jeff Skinner scored twice and the Buffalo Sabres ended a seven-game skid against Florida by defeating the Panthers 4-3 on Thursday night. Sam Reinhart had a goal and an assist, and Tage Thompson also scored in a game the Sabres played minus injured captain Jack Eichel. Buffalo coach Phil Housley said Eichel will miss at least one more game with an upper-body injury after he was hurt in the first period of a 3-1 loss to the New York Islanders on Monday. Linus Ullmark stopped 35 shots. Buffalo was 0-6-1 in its previous seven meetings against Florida, dating to a 4-2 win on March 27, 2017. More important, the Sabres snapped an 0-2-1 slide overall while improving to 5-7-4 since their 10-game winning streak, which matched a franchise record. Alexander Barkov had a goal and an assist for the Panthers, who lost for just the third time in nine games. Mike Hoffman and Frank Vatrano also scored. Roberto Luongo gave up two goals on the first four shots he faced and finished with 29 saves. Skinner sealed the victory with his team-leading 28th goal with 3:46 left, a little less than three minutes after Hoffman cut Buffalo’s lead to 3-2. Skinner and Thompson scored in a span of 2:33 to put Buffalo up 2-0 by the 7:15 mark of the first period. After Vatrano scored on a 2-on-1 break with 6:18 left in the second, Reinhart restored Buffalo’s two-goal edge by tipping in Lawrence Pilut’s shot from the right point 1:20 into the third. Vatrano and Reinhart’s goals were allowed to stand despite being disputed. Vatrano was allowed to break free out of his own zone only after Florida’s Keith Yandle knocked over Buffalo’s Rasmus Dahlin, who was two steps away from playing the puck. As for Reinhart, he appeared to high-stick Florida defenceman Aaron Ekblad in the face after deflecting in Pilut’s shot. Ekblad stood at the bench with his arms raised after watching a replay of the goal on the video scoreboard. Buffalo did have a goal disallowed 42 seconds later, when officials ruled Sabres forward Kyle Okposo interfered with Luongo before Marco Scandella snapped in a shot from inside the blue line. NOTES: Buffalo’s top line of Eichel, Skinner and Reinhart entered the day accounting for 49 of the team’s 115 goals. … Evan Rodrigues took Eichel’s spot in centring Buffalo’s first line. … Florida D Chris Wideman was scratched after practicing with the team Wednesday for the first time since being acquired by the Panthers in a trade with Edmonton on Sunday. Panthers: Host Columbus on Saturday. Sabres: At Boston on Saturday.